Parkway picnic areas can have restrooms, grills or fireplaces, water fountains, picnic shelters, and refuse disposal/recycling facilities. Larger sites accommodate groups (many mountain families, churches, and civic groups target the nearby Parkway for gatherings). Nevertheless, the picnic areas often have single tables situated off alone. 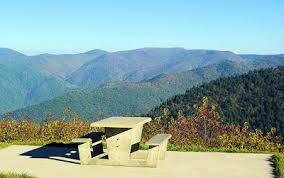 Overlooks, parking areas, and some trailheads also feature tables, so be on the lookout. And some folks just pull off the road onto a grassy shoulder and throw a blanket by the car in the shade (this is permitted, just don&#39;t park where you&#39;ll damage the roadside). There are 33 sites and restrooms in the picnic area. Additional tables line the contact station parking lot beside a path to Cumberland Knob&rsquo;s gentle summit where there&rsquo;s a picnic trail shelter. Fifty-six picnic sites sprawl east of the Parkway overlooking Bluffs Lodge. From the end loop, a short meadow walk and left on the Bluff Ridge Trail leads to a log cabin picnic shelter with fine views. Great valley views, restrooms, and thirty picnic tables flank the Cascades Parking Overlook, the start of a wonderful, 1.2-mile waterfall walk. Located between Price Lake and Price Campground, 100 picnic sites and restrooms line a meandering stream at the start of the strenuous 4.9-mile Boone Fork Trail loop. This picnic spot&rsquo;s 100 sites and restrooms lie along the banks of the Linville River as it courses toward Linville Falls. South of Crabtree Meadows Campground, the picnic area&rsquo;s 82 sites overlook an airy vista east of the Parkway. Restrooms. A1 Mountain Realty offers many options for you and your family. Our mountain property offers a variety of life styles to please everyone. Whether you&rsquo;re looking for a Ashe County family vacation home or a getaway from the hustle & bustle of city living you can find it here. From NC Mountain Luxury Homes to NC Mountain Log Home, large tracts of NC Mountain Land, NC Mountain Lots and everything in between. Let A1 Mountain Realty be your guide for all your buying or selling real estate needs. View all of our listings from our website (www.a1mountainrealty.com) or do a MLS search for any type property in the High Country.